Make organization one of your stronger points - if it isn't already - with the Manilla 3-Drawer Rattan Bakers Rack with Basket Storage. 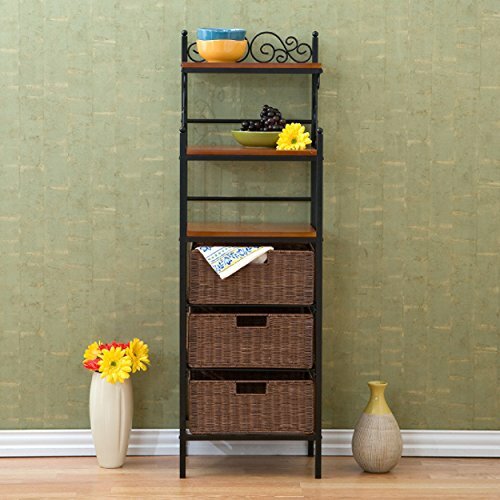 Black powder-coated metal construction with warm brown stained rattan baskets and wood shelves create a tasteful color combination sure to blend with your kitchen or dining area. Store towels, napkins, pot holders, and more in the spacious baskets, which are conveniently removable. Three open shelves provide plenty of display space. 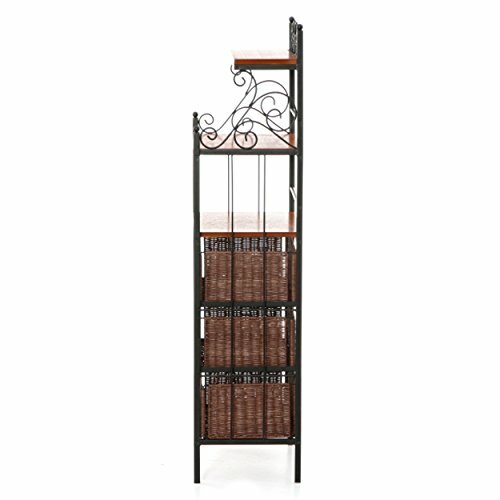 Delicate scrollwork on the two upper shelves tops off this functional piece, which offers a happy home to your miscellaneous essentials. Measures: 17W x 12.75D x 53H inches. Assembly required. Additional Dimensions Baskets: 14W x 11D x 6H inches Open shelves: 15W x 12D x 8H inches Top shelf: 15W x 7D inches About SEI (Southern Enterprises, Inc.) This item is manufactured by Southern Enterprises or SEI. 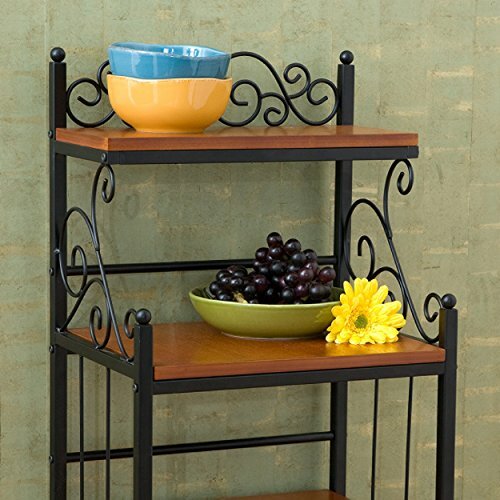 Southern Enterprises is a wholesale furniture accessory company based in Dallas, Texas. Founded in 1976, SEI offers innovative designs, exceptional customer service, and fast shipping from its main Dallas location. It provides quality products ranging from dinettes to home office and more. SEI is constantly evolving processes to ensure that you receive top-quality furniture with easy-to-follow instruction sheets. SEI stands behind its products and service with utmost confidence. 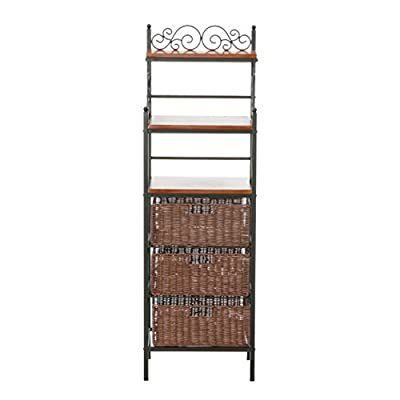 Ample storage and style in 1 succinct unit. 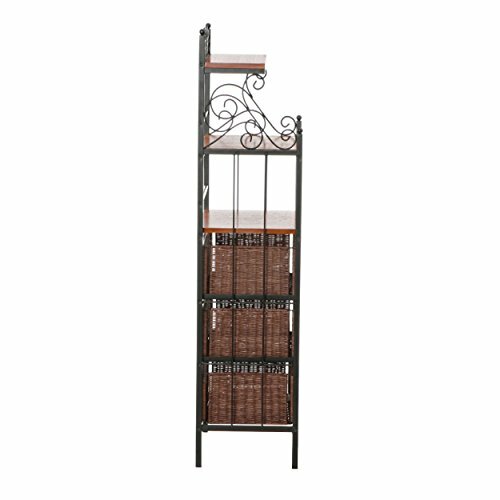 Metal construction with wood shelves. 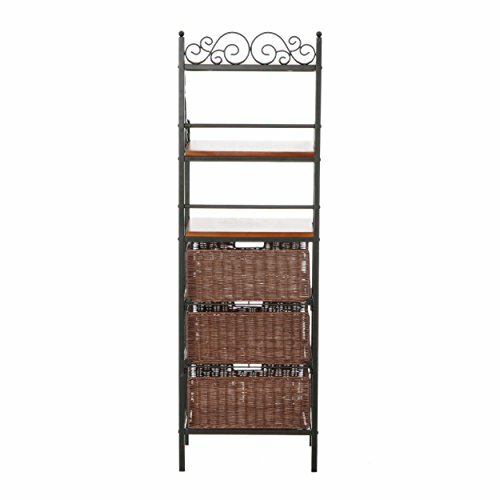 3 removable storage baskets, 3 open shelves. Black powder-coat finish. Dimensions: 17W x 12.75D x 53H inches.